In the bowl of a stand mixer, combine flour, sugar, baking powder and baking soda. While mixer is on medium speed with the paddle attachment, slowly add butter and mix until mixture resembles a coarse meal. On low speed, mix in rhubarb and buttermilk and mix until just combined. Using two spoons or an ice cream scoop, scoop out generous pieces of the dough and place on a parchment-paper lined baking sheet, spacing them about 1 inch apart. You should end up with about 12 scones. Bake scones for about 25-30 minutes, or until a light golden brown. Allow to cool slightly on a cooling rack before serving. If I listed every single reason I am so happy it’s finally (finally!) spring, it would probably take you all day to read this post. I’ll spare you my unending list and mention just a few: One, it’s warm and sunny, and two, my favorite vegetables and fruits, like rhubarb, are in season. These Rhubarb Drop Scones are the perfect way to welcome spring back into your kitchen. They’re fluffy, sweet, buttery and tart, but all of the flavors work together – they don’t overpower each other. You’ll find yourself trying to decide which flavor is most prominent, and you can’t figure it out! It’s harmony in a scone. I’ve only recently (as in, the past two years) started incorporating rhubarb into my baking repertoire. Aside from rhubarb pie, I wasn’t sure how to use the red, celery-like stuff. 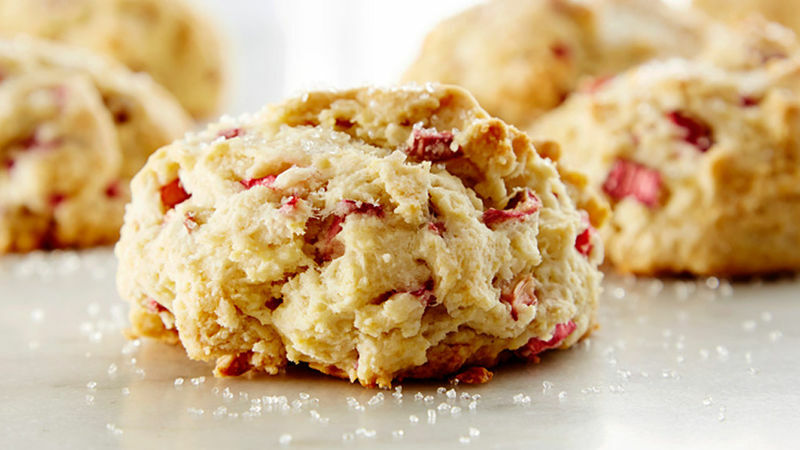 But for me, mixing rhubarb into scones is a great way to use the fruit – it’s tart and sort of sweet, which makes for a great combination with the buttery, mild flavor of a scone. I’ll admit, rhubarb isn’t quite in season out here in the Midwest, which was a bummer (we have to wait until early May, according to the local grocer), so I had to use frozen rhubarb for my recipe. Still, it turned out great. I can’t wait to try this recipe again with fresh fruit, basking in the spring sun that finally (finally!) is coming through my kitchen windows.